When insights from AIM are coupled with aggregate data, you increase physician insights exponentially. This, in turn, provides more opportunities for connecting with physicians who are the best fit for the position. 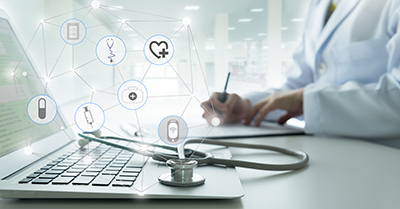 As a healthcare recruiter, having access to such individualized online behavioral data, which is provided in real time, you can immediately contact interested providers with information about the positions they're researching, expediting fulfillment. The combination of these AIM-plus-web analytic insights also gives you an edge over the competition. Here’s how it works. Let’s say Dr. Benjamin, a seasoned pediatrician currently located in Oregon, is on the job search and stumbles upon an open position at your healthcare facility in Boston. She spends seven minutes on your website learning more about your health system, but does not register with your site or formally apply. In the past, this would have been a lost opportunity. You would have had no way to identify Dr. Benjamin or connect with her personally to talk further about the position, competitive pay and benefits, or collaborations with other area medical institutions. With AIM, you can get a wealth of information about opted-in physicians and follow their online journey. Better yet, all of this can be accomplished without Dr. Benjamin needing to log onto your site. Through the information provided by both AIM and web analytics, you learn Dr. Benjamin is particularly interested in juvenile diabetes. Prior to arriving on your staffing site, she spent time on a popular peer-reviewed journal site reading up on a new treatment protocol for the disease. Armed with this information, you can reach out to Dr. Benjamin to inform her about the clinical trial on juvenile diabetes your academic center is conducting. You can also discuss with her the groundbreaking work your physicians and other faculty are participating in to further an understanding of diabetes in children. By tailoring your communication in such a personal way, it becomes much easier to build a relationship with Dr. Benjamin and convince her on why she should consider relocating to join your health system. As physician recruiting becomes increasingly competitive, this type of personalized approach is a necessity to further your recruitment efforts. When you incorporate AIM to help your website analytics go deeper and become more meaningful, you have the recipe for building a successful healthcare team.